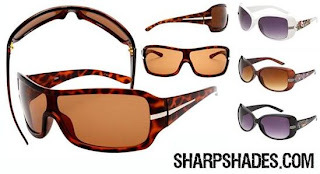 $4 for $20 Worth of Designer Quality Sunglasses from SharpShades = At Least 2 Pairs for $4! UPDATE: Use code FIREWORKS to get this deal for only $4.00!! Here's another great deal you can get at So Lo La' Deals today! This one will get you $20 worth of designer quality sunglasses from SharpShades.com for only $4. With most glasses being $8.95, you can get at least 2 pairs for your $4...that's an awesome deal! Their glasses are inspired from top brands including: Coach, Prada, Louis Vuitton, Guess and many more. Click here for more info on the deal! You need to click on the Daily Deals image tab on top of the page with the 2 bags on it because this deal is not on the homepage. It is on Page 2.